Instagram user @vladiajurcovaspencer This beauty was found in downtown Asheville, North Carolina at an art walk. Instagram user @awdart The detail in the water here is out of this world. Instagram user @bottoms_up_craft_designs Check out the detail on this one. All the bottle caps on this crab are even facing the same way. Instagram user @lasirena_nyc This Mexican clock users bottle caps for each of the numbers. Instagram user @davegraminstacool This Blue Moon bicycle is a pretty sweet ride. Instagram user @amberjlanese This bralette was made using 100 bottle caps. Instagram user @sara.mancus Sometimes art is made INSIDE a bottle cap rather than with it. This Banksy bottle cap is pretty unique and definitely something to look at. Instagram @jwrubenstein This rocketship is street art in Pittsburgh, PA.
Instagram user @recapsart For when you really love the Cubs. Instagram user @capworks804 These give a whole new meaning to the term "beer googles." Instagram user @detournola This Abita dog was on display in the brewery's home of Louisiana. Image credit @snuggs0331 These tiny bottle cap bugs are too cute. Instagram user: @cheftimlewis Heeeeeeeere's Johnny! Instagram user @heirtotheart The force is strong with this one. Instagram user @aleabone They call her "Cap Woman." Instagram user @cottonwoodartistry A beer a day keeps the doctor away, right? Who says the best place for all those bottle caps you have lying around is the recycling bin? Bottle cap art has become a pretty big thing over the past few years, with artists creating some epic stuff from the tops of their favorite brews. 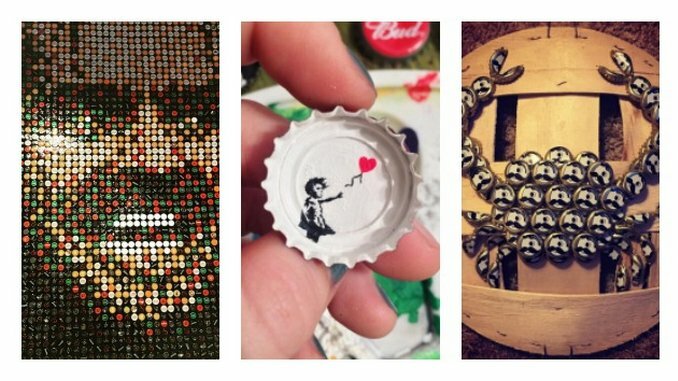 We scoured Instagram looking for some of the best bottle cap art out there, and found everything from some cute tiny sculptures for your desk, to people who have created some wall-sized art with their leftover caps you’ll have to see to believe. Check out a gallery of some of our faves above, and be sure to check out some of the other amazing things these artists have created on their individual Instagram feeds.